October 25, 2012, Woodstock, IL — Newer Technology, Inc. (NewerTech®) http://www.newertech.com, a leading developer of Macintosh®, PC, iPod®, iPhone®, and iPad® performance upgrades and accessories, announced today its miniStack® external storage solution is now available with an OWC Mercury Solid State Drive in four capacities from 120GB to 960GB priced starting from $199.99. Specifically designed to match the appearance and size of Mac® mini models from 2010 to the new 2012 machine introduced this week by Apple®, the miniStack 'stacks' on top of the mini to conserve precious desktop workspace. With the new SSD-based models, the miniStack can be used as a boot drive for faster OS loads as well as for dramatically faster processing with intensive graphics and A/V applications. With hundreds of thousands of units in the field, the OWC Mercury SSD brand is the time-proven choice for highest reliability, quality, and performance. The 2.5" Mercury SSD comes installed in miniStack via a NewerTech AdaptaDrive® and is ready to run and deliver SSD performance advantages straight from the packaging. Now, mini owners seeking to eliminate the performance 'bottleneck' of their internal drive don't have to spend valuable time swapping out the factory drive. With miniStack, SSD performance offering data rates up to 300MB/s is Plug and Play easy while the mini's internal drive remains useful for media/archive storage and/or backups with Time Machine®. While it features the same 1.4" H x 7.7" W x 7.7" D dimensions and aluminum finish of the Mac mini, the miniStack is also an ideal space-saving, high-performance external drive for additional uses. Its multi-interface flexibility (FireWire 800/400, USB 3.0/2.0, and eSATA) enables use among multiple Macintosh computers and laptops and virtually any Windows® or Linux®-based computer with a USB or FireWire port. miniStack can also be added to an Airport Extreme® wireless network via USB to wirelessly share files, perform Time Machine backups, and share other devices like printers. Plus, miniStack is A/V rated for high-performance home entertainment systems and sharing content with Apple TV®. With a choice of SSD and HDD pre-configured solutions with up to 4TB of capacity, as well as two 'add your own drive' enclosure only kits, the Newer Technology miniStack is immediately available from retailers and Newer Technology's exclusive distributor, Other World Computing (OWC®) starting from as low as $84.99. 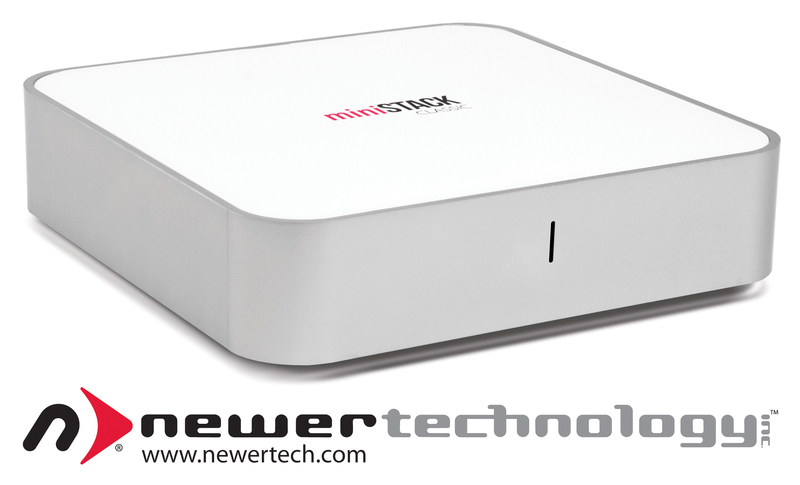 For more information on the miniStack and reseller inquiries, visit: http://www.newertech.com/products/ministack.php. For more information on Newer Technology's complete line of accessories and upgrades for Macs, PCs, and iOS devices, visit: http://www.newertech.com. Apple, Macintosh, Mac, FireWire, Time Machine, Airport Extreme, Apple TV, iPod, iPhone, and iPad are trademarks of Apple, Inc., registered in the U.S. and other countries.